← Monsoon Showers Bring Fall Flowers?? Tricks and Treats! Mostly Treats! Happy Halloween!!! as you can imagine, this is my favorite time of year! i had planned to go big or go home this year… so i pretty much went home. i knew october was upon me but all i’ve been able to think about is november and getting the nursery done (which it still is not). so while i skimped on the decorations, totally neglected to make the hanging muslin ghost lights for the tree outside, and am still debating if i’m going to make the “future zombie killer” maternity shirt (since i waited too long to order the prosthetic to make the Alien chestburster shirt)- i refused to forgo the treats for trick-or-treaters! this holiday is fun for all ages but it’s really all about the kids in my opinion. every year i try to do something special. one year my roommate used construction paper to make sturdy gift bags with jack-o-lantern faces cut into the front and lined with more paper. several of the bags were constructed to have moving parts like tongues flicking out and arms moving. they were really adorable! we filled them with several novelty candies, stickers, and toy whistles. i was so giddy when half an hour after the bags started going out, we started hearing whistles sounding all over the neighborhood! oh bet parents and teachers were loving us that week! living with my parents for three years, i didn’t get to celebrate the candy part of Halloween. their home is in an older established neighborhood where there aren’t a lot of kids. i think in those three years, we had a total of 6 trick-or-treaters. also, the town’s central shopping center hands out candy at all of the stores early in the evening before the sun has even disappeared. my love of traditional trick-or-treating is so great that i have already informed my husband that our daughter WILL go door-to-door in our neighborhood asking for candy. he got excited too and insisted that she have a pillowcase for her collections! fine by me! OR she can carry a plastic pumpkin like i did OR i can even make a really cute trick-or-treat bag for her and I’LL carry the pillowcase that she can dump her treasures into every couple of houses or so. for both of us, the memories we have of trick-or-treating are some of the funnest most exciting ones we have, we want that for our daughter, and i want to help create those memories for other kids every year. WE’RE BRINGING TRICK-OR-TREATING BACK! so this year i wanted to do a full size candy bar and a Halloween whistle for every ghoulish visitor. i was really looking forward to hearing those whistles start going off around the neighborhood. however, budgets being what they are and a baby on the brain, i had to modify my plan. with some small delicious changes, this year’s treat bags were created. and i’m quite proud of them! 2. a variety of candy. we bought 2 variety bags of 95 peices each for $8.88 at walmart. we have lots of extra candy left over for any ghosts, pirates, princesses, or zombies that show up after the first 25. each treat bag comes with 4 pieces of candy: reeses’ peanut butter cup, crunch bar, whoppers, 3 musketeers, hershey’s chocolate, butterfinger, or kitkat. every bag has a whoppers in it because there were so many! 3. a fiendish halloween pencil. the one pictured has skulls running down it. purchased at the 99 Cent Superstore in packs of 10. since i need more twist ties for the final five bags, i’m going to pick up some accordion straws with skulls for those bags as they come in packs of 5. 4. the final product. tip: put the pencil or straw in the center of the bag so the twist tie can be wrapped around it for extra support! well… at least I think i’m clever! 6. adorable doorhanger skeleton bride and groom i bought last year before the wedding. intended to use them to hang on our chairs but didn’t end up doing it. so now they are my models. don’t they look like they belong on ANTM!? they haven’t eaten in years either and look at those figures! 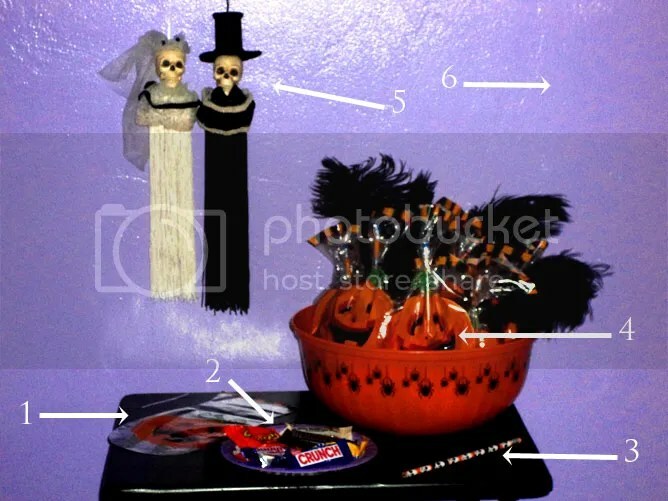 This entry was posted in Crafting, Eating and tagged candy, halloween, holiday, october, treats, trick-or-treat. Bookmark the permalink. Monsoon Showers Bring Fall Flowers? ?